The drive north from San Diego along historic 101 will take you through a number of beach towns that are popular with the locals and tourists. Come visit these popular beaches in the beach cities north of San Diego. These include the beaches in San Onofre, Camp Pendleton, Oceanside, Carlsbad, Leucadia, Encinitas, Cardiff-by-the-Sea, Solana Beach and Del Mar. 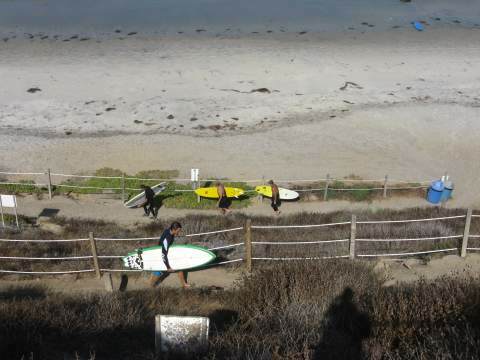 As locals, we love many of the smaller North San Diego County beaches such as Moonlight Beach for bonfires or Beacons for surfing in San Diego. In fact, half the beaches in San Diego county lie north of the city of San Diego, and are often overlooked in other beach websites or travel guides. We invite you to explore and enjoy these hidden treasures of San Diego. From north to south, these are the North San Diego County Beaches. 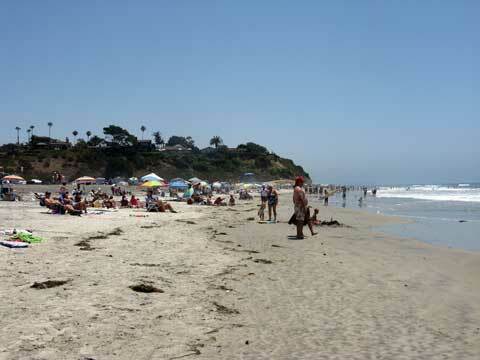 If you are looking for North San Diego County beaches, you can’t get further north than San Onofre beaches. 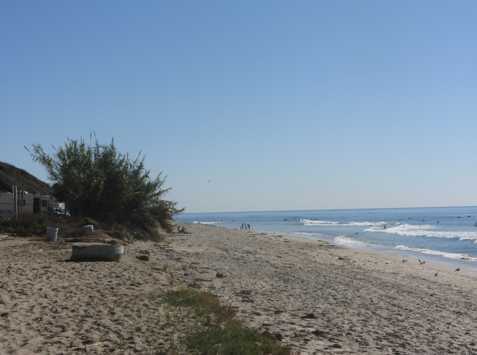 Just south of Orange County and north of Camp Pendleton are the San Onofre Beaches. Lower Trestles is a world-famous surf break. Old Man's Beach just down the coast north of the nuclear power plant has good beach facilities and is also a popular surf spot for beginners and veterans with its slower waves. South of the nuclear power plant is Trails, three miles of beach along the San Onofre Bluffs State Campground, a popular southern California beach camping spot, which has both tent and RV camping. Trail 6 at the southern end has some clothing optional fans. If you are active duty or retired military personnel or dependents, you qualify to use several excellent beaches and campgrounds on Camp Pendleton Marine Corps Reserve. 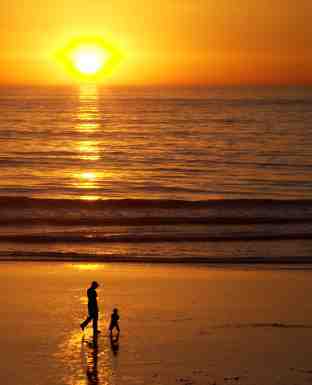 In fact, you can bring non-military guests with you to use these great San Diego beaches. 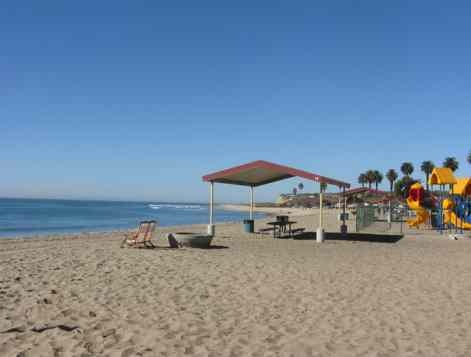 San Onofre Beach, not to be confused with the public one, has cottages, campsites and group camping exclusively for military personnel. It is located at the north end of Camp Pendleton right in the middle of the public San Onofre surfing beaches. Further south on Camp Pendleton at the northern edge of Oceanside is Del Mar Beach, which also has cottages, campsites and group camping. Camp Pendleton’s Del Mar beach has a very large sandy beach, excellent surf spot next to Oceanside’s North Jetty, and a small marina. Oceanside Beaches - The city of Oceanside just south of Camp Pendleton, has nice sandy beaches without the crowds of the San Diego beaches. 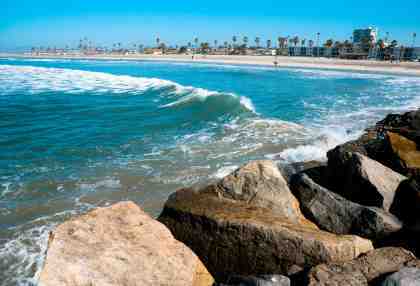 Oceanside Harbor, aka The Jetties, is a popular surfing and fishing area at the north end. Oceanside City Beach, along The Strand, has a boardwalk, pier and wide open sand, and is great for swimming and boogie boarding. It also has the only San Diego McDonald's restaurant on the beach. Nearby is the California Surf Museum. Further south is Buccaneer Beach, a locals beach and surfing spot just across the street from Buccaneer Park. 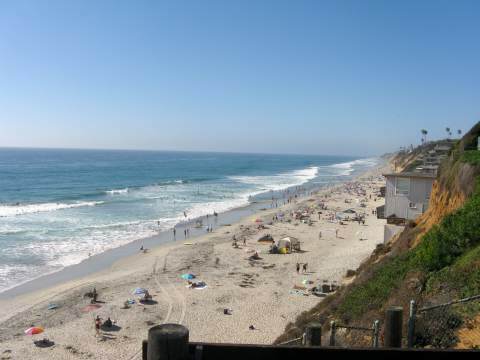 Carlsbad Beaches - If you are looking for north San Diego county beaches to surf some good waves, or spend a day at the beach, try Carlsbad Tamarack Beach, which boasts a long concrete boardwalk, good for walking and biking. Other Carlsbad beaches include Warm Water Jetty, Ponto, South Carlsbad State Beach and South Carlsbad State Beach Campground. If you walk or run south at low tide you will arrive at Grandview Beach in Leucadia, a beach community of Encinitas, but you can also continue down the coast for as far as you like. If you are looking for north San Diego county beaches to surf some good waves, or to spend a day at the beach, Beacons Beach, formally called Leucadia State Beach, is a long narrow beach that runs for about 3 miles from popular and crowded Moonlight State Beach to the south and South Carlsbad State Beach to the north. There are three public access points to get from the steep cliff to the narrow beach below: Grandview Beach, Beacons Beach, and Stonesteps Beach. Most of the surfers use Grandview or Beacons entrances, where there are public parking lots, and leave Stone Steps to the local beach walkers. Encinitas Beaches - Encinitas has a fantastic beach town culture, and is worth a visit to the historic 101 strip of Bohemian style shops and restaurants. The most popular beach in Encinitas is Moonlight Beach, and Moonlight is the best beach in San Diego county for beach bonfires. 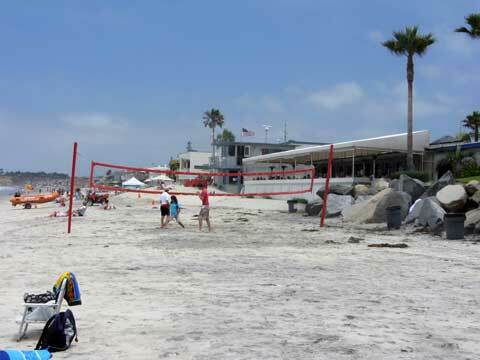 It is a popular north San Diego beach hangout for teenagers and families. Just south of Moonlight Beach is D Street beach access point. Boneyards beach runs from D Street south to Swami’s point, a famous surfing spot. This makes an interesting beach walk at low tide (3 feet or less). More Encinitas California Beaches - Just south of Swami’s in Encinitas, California is Pipes, a nice surfing break just north of San Elijo State Beach campground, a very popular San Diego beach camping spot, followed by Cardiff Reef on the south end of the campground where the cliffs end. Cardiff State Beach at the southern end of Cardiff is best known for its restaurant row along the beach. It is one of the few SD beaches where leashed dogs are welcome at all times. Solana Beach, CA is a charming beach town sandwiched between Cardiff to the north and Del Mar to the south, with small beaches used mostly be the locals and some tourists who stay in beach rentals along the bluffs. 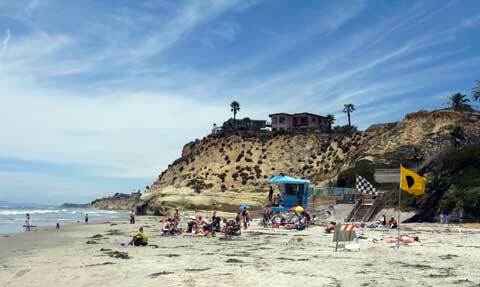 Fletcher Cove, also known as Pillbox, is the most popular beach in Solana Beach and was recently renovated. It is popular with families and has ample free parking. Smaller beaches in Solana Beach that are easy to miss include Seaside, a good surf spot; Tide Beach, with some tide pools to explore; and Seascape Beach and Del Mar Shores on the north side of the San Dieguito river mouth. Del Mar, California is an upscale but quaint community or village 20 miles north of San Diego. Families love the Del Mar City Beach, with the deep sandy beaches at the south end near 15th Street, that stretch all the way north to 29th street. Powerhouse and Seagrove Park extend this lovely beach. This is one of the best of the north San Diego county beaches. Just south of Solana Beach Cal. on the historic 101 are the two Del Mar dog beaches, both north of 29th street. Go to Del Mar Beaches page for more information.